Spend a day in the Big Apple and visit some of New York City's most famous attractions on this full-day sightseeing tour from Boston. See one of the world's densest skylines aboard the Statue of Liberty cruise. Take pictures of Manhattan Island from the top of the Empire State Building. Stop in Times Square, and at Fifth Avenue, Rockefeller Center, the United Nations Headquarters, and the USS Intrepid Museum. Also, see the celebrity wax sculptures at Madame Tussauds plus much more. This tour will depart from Boston at 7am, heading to the Big Apple via bus. Along the way, stop at a service area for a break, then start the day of sightseeing in New York City around 11:30am. Take a 1-hour cruise (admission not included) and view the city’s magnificent skyline and sites including the Statue of Liberty, the South Street Seaport, and the Brooklyn Bridge from the Hudson and East Rivers. Continuing the day, visit the dynamic and educational Intrepid Sea, Air, and Space Museum (admission cost not included), including an authentic aircraft carrier that served in tours of duty in World War II and the Vietnam War, the Space Shuttle Pavilion (home to the world’s first space shuttle), and a series of the world’s fastest military jet and commercial aircraft. Around 2pm, arrive in Midtown Manhattan for a trip to Times Square. Visit Madame Tussaud's Wax Museum (cost not included), and enjoy lunch. After taking in the panoramic view of the Big Apple from atop the Empire State Building (entry fee not included), the tour will then pass by Rockefeller Center, with great photo opportunities at NBC Studios and Radio City Music Hall. When leaving New York City, pass by the United Nations building, which has served as the global headquarters of the United Nations since 1952. Return to Boston around 10:30pm, depending on the weather and traffic conditions. 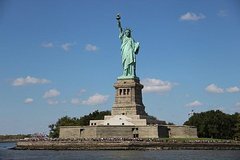 Note: The Statue of Liberty cruise, the Intrepid Sea, Air, and Space Museum, the Empire State Building, and Madame Tussaud's Wax Museum are not included in the cost of this tour and are payable at the entrance of each attraction.